Fresh off the Cantagalli presses is the tenth Report on the Social Doctrine of the Church in the World of the Observatory Cardinal Van Thuân. This year, as its title indicates, the Report is dedicated to a burning topic, “Islam, a political issue”. We posed a few questions to the President of the Observatory and Bishop of Trieste, Most Rev. Mons. Giampaolo Crepaldi. Your Excellency, why this topic? Our Reports’ core themes emerge from an analysis of the main dynamics at work in the world. We don’t invent them on our own and see them at work in reality. In my opinion that is no doubt that a political assessment of Islam, especially in Europe, but not there alone, is a clearly emerging issue right before our eyes, but not always suitably discussed. Aren’t you afraid of bothering someone? This certainly is a controversial and very delicate subject. In previous Reports we dealt with immigration and Europe, and avoided adopting a politically correct stance. We have adopted the same approach in this Report, doing our work with no fears at all. The Catholic Church favors receptivity and dialogue with Islam, supporting the construction of mosques, and sustains that it is a religion of peace. You, however, consider it a political issue. Is there any contrast there? In our Report we have done something that no one ordinarily does: assess Islam in the light of the principles of the organization of the social and political community set forth in the Social Doctrine of the Church. One thing is interreligious dialogue with Islam, and another thing is to consider the contents, the substance of the public ethics of Islam. Then again, this religion is a political project in a direct and essential way. Verifying if Islam is advancing proposals acceptable by the Social Doctrine of the Church is a service of truth for one and all; for the Church which must also take into consideration its own social doctrine in the encounter with religions, and for politics insofar as the social doctrine of the Church also embodies natural principles and values. What approach did you use in your analysis of political Islam? The Report consists of four specialized studies on Islam, an extensive introductory synthesis, and a presentation on my part. All these elements analyze Islam on the basis of the face of God according to this religion. There is an internal consistency in religions. Everything stems from how God is conceived, and this applies to Islam as well. We can also assert practically everything, but it all depends on how a revealed religion conceives revelation. Just how does Islam conceive God? Coming to the surface in the Report is Islam’s conception of God as will and omnipotence, not as truth and essence. God issues decrees that call for literal and blind obedience. As Benedict XVII said at Regensburg in 2006, the God of Islam is beyond any category, with no analogy with the world founded on truth, and could have even given us precepts contrary to the ones He gave us. Such an approach therefore has no need for the relationship between faith and reason that is essential in Catholicism. Islam says: in the beginning was the Will, not the Lagos. Islam as well, however, speaks about creation by God, and hence Islam will also see an order in creation, a law impressed therein by God. Yes, Islam does think the world is divine creation. This creation, however, was an act of will that had nothing to do with the requirements of truth; it was a divine decree and not the expression of a Logos. Hence, the precepts of moral order do not stem from an finalistic order expressed by created nature where reason and revelation may encounter one another. In other words, there can be neither a natural law nor a natural moral law. Moral precepts stem from divine decisions contained in the Qu’ran or in the life (words and deeds) of Muhammed, and are to be complied with in a state of total submission. Islam is a juridical religion. What notion of law emerged during your analysis of Islam? The Islamic conception of law derives from the points just considered, and lastly from the vision of God. It is most difficult for a Muslim to distinguish between the divine law derived from the will of God and communicated to Muhammed, that is to say religious law, and the law established by the political community or the national authorities, this being civil law. Moreover, our Report recalls that underway in many Arab countries for some time has been a process of ‘constitutionalization’, that is to say the insertion of the charia, or Islamic law into the text of the respective national Constitutions. Then again, if the law is a decree of the divine will, it cannot, as we have said, know anything about the mediation of natural and rational law which, in the Christian tradition, has placed reason and revelation in relationship with one another, and at the same time guaranteed mutual and legitimate autonomy. Nowadays, many people are talking about a moderate Islam and a radical one. Is there any truth in such a distinction? Our Report feels that when we consider the selfsame person of believers in Islam, there is a certain degree of sense in this distinction. There are those who are more open minded and receptive, and others less so. However, if we concentrate on the internal coherence of Islam beginning from the vision of God, this distinction becomes weaker. Let us not forget that the divine decrees or Islamic law constitute the umma, the Muslim community, with its absolute exclusivity and conquest bound outlook. Embodied in Islamic law is the distinction between Muslims and non Muslims as anthropological categories. In addition, the umma is universal in nature and must spread throughout the entire world, also travelling the pathway of direct conquest. When we consider aspects such as these, the distinction to which you refer can well exist in contingent situations, but does not correspond to the essence of Islam. At times Catholics think Muslims can join forces with them in the defense of life and the family in opposition to laws and policies contrary to life and the family. Are there any true grounds for such an expectation? Dialogue with Muslims on points such as these has to be pursued, but clearly recalling two aspects. The first one has to do with the fact that Islam often has different ideas compared to what Catholics think about these themes. This happens, for example, when considering the relationship between man and woman within family life. Secondly, it must be kept in mind that the fundamental motives for taking action are different. It is one thing to take action against abortion because it is an evil according to natural reason and revelation, and another thing to take action because thus has God decreed with an act of His will. This is the Observatory’s tenth report; quite an accomplishment. What’s your assessment of this decade? We began ten years ago with the first Report whose topic was the financial crisis. We then plowed ahead focusing our attention on major emerging issues in the light of the Social Doctrine of the Church. We have been faithful to the commitment to render manifest the fecundity of that social doctrine and the ability of the Catholic faith to create culture, Catholic culture. We are therefore pleased to have done what our Observatory was born to do. The core themes of our Observatory’s three latest annual Reports are closely connected to one another in their respective analyses of social and political issues so evidently linked together in today’s world. The VIII Report (2016) was dedicated to the phenomena of migratory flows and immigration, especially regarding the European continent, and was entitled “The Chaos of Migration, Migration in Chaos”. In dealing with this burning issue, that Report was courageous enough to say something inspired by the “Christian realism” of the Social Doctrine of the Church, and not just remain within the realm of a generic and void spirit of receptivity. One of the most important features of the immigration phenomenon is the threat it represents for Europe, and above all for its Christian tradition. At the same time, the flows of immigrants reveal and highlight the great frailness of the continental unification process and the current staid nature of the ideal inspiring it. This set the stage for the next Report – the IX one in 2017—which was dedicated to Europe and entitled “Europe, the End of Illusions”. In this case as well I can say the Report’s overall assessment was quite original in its severe judgment of the current phase of stalemate and implosion of the pro-European project, with no rhetorical or sentimental overtones. At that point it was necessary to take a third step consistent with the two previous Reports and tackle the main item on Europe’s current agenda, this being the presence of an increasingly active political Islam. It does not suffice to evoke the principle of religious freedom with respect to Islam, because in so doing neither the problem of the truth of religions nor that of the very particular characteristics of Islam are tackled. Moreover, the European countries and institutions intend to react to political Islam with the principal of tolerance alone, without considering that this is a religion which, as far as this point is concerned, cannot give anything in exchange for reasons linked to its theological nature. We therefore witness ongoing accommodation to the demands and requirements of political Islam, a naïve acceptance of its requests without anything in exchange, an incorporation of aspects of Islamic law in the legislation of European countries, doubtful hopes in the possible future existence of a “European Islam” as the ripe fruit of a hoped-for “moderate Islam”, while not considering that a certain fundamentalism is inseparable from Islam in light of its conception of both revelation and creation. The Catholic Church in Europe only tackles this issue from the viewpoint of interreligious dialogue, and by now forgets to call on European countries and institutions to defend the continent’s Christian roots. In addition, it doesn’t really know how this request can be reconciled with the right to religious freedom it heralded after Vatican II. What therefore happens is that the Church urges the reception and integration of Muslims, while often without any deep knowledge of that religion and its intrinsic requirements regarding society and politics. On the other hand, European politics adjusts to the dynamics of ‘Islamization’, thinking it can dominate them by governing them and even imposing them on reluctant countries resolved to defend their own identity. 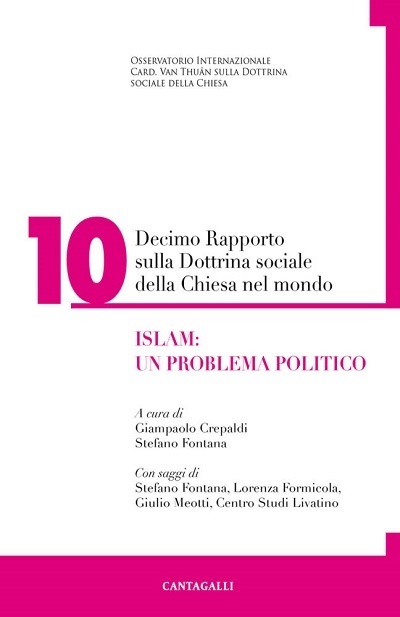 The theme of this X Report – political Islam – is analyzed, just like its predecessors, from the point of view of the Social Doctrine of the Church. In this case, however, this represents something new compared with earlier Reports. I believe I can say that thus far the Church has never taken a close look at the issue of Islam as a problem concerning the Social Doctrine of the Church, and to which the principles of the Church’s social teaching are to be applied. As I pointed out above, Islam is looked upon as a matter regarding interreligious dialogue, or else a subject to be studied from the viewpoint of the history of religions or the theology of religions. It does not seem anyone has ever analyzed it in terms of its compatibility or incompatibility with the principles of the Church’s social doctrine, that is to say with the selfsame foundations of a sound society custom-made for man and God. This is why I have no qualms about saying that this Report opens a new ‘avenue’ of study and lays the foundations for considerable and demanding work in the future. Moreover, this new ‘avenue’ to be travelled by the Social Doctrine of the Church is rendered duly necessary in the light of the outcome of the two previous Reports I mentioned above. 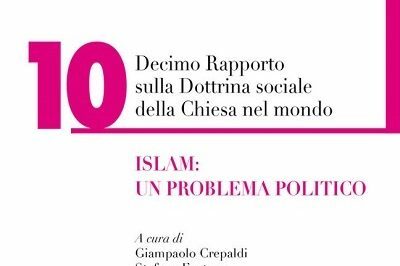 In fact, political Islam is very much present in Europe not only in the vestiges of the many tragic terroristic phenomena, but also with the birth of political parties in many European countries with candidates vying for posts in municipal, regional and national elections. Added thereto is the considerable pressure exercised to ensure the acceptance of some typical manifestations of Islamic cultural, morals and mores so that elements of Islamic rights and Islamic law would also be embodied in legislation in our respective countries. Another element not to be forgotten is financing for the construction of mosques without any form of compensation for Christians in Islamic countries, to say nothing about the propaganda of Islamic intellectuals, whose primary example continues to be Tariq Ramadan. In other words, political Islam is not just something ‘on paper’; it is a political reality present all around us. Therefore, it is no longer possible for the Social Doctrine of the Church not to deal with it. Many Catholics think Muslims can help them in the defense of life and the promotion of the family against the relativism of dominant Enlightment-driven thinking in Europe, which is now tending towards of blatant nihilism. For example, people say Muslims are against abortion and homosexuality just as Christians are, and could contribute to pro-life and pro-family endeavors. When thinking along these lines, however, people forget that in the Islamic context it is most difficult and practically impossible to speak about natural law and natural morality, while for Catholics these are the selfsame grounds for commitment in the defense of the aforementioned moral principles. This is because, in the eyes of Islam, God’s act of creation took place not according to a truth, but according to a will. Therefore, it does not express an ontological order, but rather a manifestation of Islamic positivism. In addition, Islam has a different vision of both family and women compared with the Social Doctrine of the Church. Therefore, while it may be argued in nominal terms that Catholics and Muslims are engaged together in just battles, emerging when we explore things in depth are considerable differences regarding politics as such, even if said differences are theological in origin. Three are the terms in this Report’s comparative analysis: Islam, the Social Doctrine of the Church, and the ideology of western liberalism. We have to be clear about these three ambits, and this too is one of the Report’s aims. Islam often aligns Christianity with the western world. There is documentary evidence supporting the fact that Muslims nowadays associate Christianity with western neopaganism. There may well be historical reasons for this sense of disdain, but in theological terms it stems from the Islamic subdivision of humankind into Muslims and non Muslims that concern Christians as well as Jews and, even more so, pagans. If Muslims stand against Christianity because they consider it ‘western’, western countries themselves often open the doors to Islam in an indiscriminant manner in order to shove Christianity into a corner for what we could call purposes of anti-Christianity. The aim of the celebration of the unchallenged positive nature of the multi-religious society championed by the radical western neo-Enlightment is to create difficulties for Catholicism in Europe. This is the reason why whoever wants to use the Social Doctrine of the Church in order to assess political Islam has to do so without inducing any confusion by bringing pro-western ideology into the picture. This is a very important approach we wanted to adopt in this Report. When studying certain issues of great political importance, for example, the concept of laicity, human rights or democracy, very evident become the many differences between Islam and the Social Doctrine of the Church, but there are just as many differences between the latter and the political vision of neo-Enlightment modernism in the western world. Therefore, when critically commenting on certain Islamic convictions, it is necessary to do so in such a way as to avoid giving the impression that said critique is an effort to enhance western convictions as such. Quite often, however, people often criticize the limits of the Islamic vision of laicity, human rights and democracy, but do so by arguing in favor of how these same issues are dealt with and considered in western politics which, on the contrary, is often in contrast with the principles of the Church’s social teachings. In other words, the latter has to make things clear on two fronts: that of Islam, and that of western political nihilism. Moreover, when we consider things from another viewpoint, we note that the Catholic theological progressivism that builds bridges in dialogue with Islam, also on the aforementioned subjects of laicity, human rights and democracy, then does the same thing with the political ideology of post-religious Europe. Underway is an effort to patch together a syncretistic political vision in which the principles of the Social Doctrine of the Church lose any meaning at all. In order to be able to consider political Islam in an objective manner, the Social Doctrine of the Church must shed itself of compromises with the western world’s neo-Enlightenment political philosophy, and in order to consider the latter in an objective manner, it has to shed itself of a superficial and naïve consideration of political Islam. It is the intention of this Report to develop this triangle of argumentative considerations. President of the Observatory Cardinal Van Thuân on the Social Doctrine of the Church, Archbishop of Trieste, Chairman of the ‘Caritas in veritate’ Commission of the Council of the Episcopal Conferences of Europe (CECE).